Click to listen here (as delivered in Nantucket on February 18, 2018). You may remember the comic strip by Bill Waterston, which ran from 1985 to 1995. Calvin, aged 6, was part Christopher Robin and part Dennis the Menace, and his stuffed tiger, Hobbes, regularly came to life in Calvin’s active – and sometimes too mischievous for his own good – imagination. Together, Calvin and Hobbes went on adventures around the universe and considered the big philosophical questions of the day. And occasionally annoyed the crap out of his neighbors and his exasperated parents. One day, Calvin built a transmogrifier. To us, it was just an upside-down cardboard box with a dial drawn on the side. But to Calvin and Hobbes, it was a machine that could turn them into whatever they wished to become – eel, baboon, bug, dinosaur, tiger, toad, and even worm. While everyone else still saw a little boy and his stuffed tiger, Calvin and Hobbes saw themselves – transmogrified – transformed in a surprising manner. I think sometimes we forget that we can transmogrify things – especially in religious communities. We often joke – because otherwise we would cry – about the seven deadly words of the church: “But we’ve always done it this way.” That can be about everything from how the coffee is made to how the hymns are sung to how we understand the principles and ethics of our faith. In fact, let’s look at our principles for a moment. Do me a favor and turn to the page of principles in the hymnal – in STLT it’s about 8 pages in, in STJ, it’s about 11 pages in. There they are, our principles. Our organizing statements of who we are and what we believe. Nicely laid out, in a list. We even tend to number them, and quote them by number – our fifth principle calls me to fight for responsible gun control legislation, I’m doing third principle work in learning about Hinduism, I’m a seventh principle guy so I invest in renewable energy. A nice, handy, step by step list. Heck, you could even do a seven step program, isolating each principle and focusing on them one at a time. Many congregations – maybe this one too – have experienced seven principles worship series. Instead of an ordered list, we have a wheel…no numbered principles, but rather a different pattern of organization. A surprising way to see them. As you can see, I hope, the center – the axle – is the inherent worth and dignity of every person. It’s where we start, where everything else moves from. Then encompassing it, as the rim, is the interdependent web of which we are all a part. And the spokes are the other principles, the ways we understand ourselves in the world, the ways we act in the world because of who we are and where we are. Let start with this section – the spoke calling for justice, equity, and compassion in human relations. Alone, it sounds pretty good; it’s the cornerstone of the Unitarian Universalist Service Committee and of every social justice action we take, both within and outside Unitarian Universalism. We take this call on faith, surely. Those things all sound good, are all preached by the major religions, and who doesn’t want justice, equity, and compassion? As a bullet on the principles list, it’s positive and a bit of an ‘of course’. Unitarian Universalists are so good at questioning things, but often we forget to question what’s underneath our own principles. They’re written on the page – literally – and so they are there, set in stone as it were. Often we ask “What” – what do they mean, or “How” – how do we affirm and promote them. But rarely do we ask “Why” – why are they important for us to affirm and promote. When we change how we see them, we suddenly have a way to question the ‘why’ of our principles, to interrogate the deeper meanings, to see the connection between the individual and the world. Why is justice, equity, and compassion so important? Because if I as an individual am inherently worthy of dignity, then so must every other individual. And if we are all connected, how can I be like the pigs in Orwell’s Animal Farm and say some animals are more equal than others? How can I not see that the compassion I hope you’ll show me might be worth showing to someone – everyone – else? This principle calls us to be in that state of becoming just, equitable, compassionate – we are never JUST just, but if we remember who we are and where we come from, we are BECOMING just. The justice, equity, and compassion we get from the world and see in the world helps us become more just – to others, but also to ourselves. But this wheel…Ian’s pesky new way of looking at things… well, it’s not letting us off the hook. Instead, it is reminding me of what David Bumbaugh wrote: “In this interconnected existence the well-being of one cannot be separated from the well-being of the whole, that ultimately we all spring from the same source and all journey to the same ultimate destiny.” In other words, y’all can’t grow into harmony with the Divine without me, nor I without you, nor all of us without each other. It is this kind of questioning – asking the Why of our principles, and seeing this deep human connection –led our organization Standing on the Side of Love to realize that the words of its name actually did not show compassion to every person – especially the person who cannot stand and finds it difficult to be included in the activities of an organization that insists on the metaphor of standing. Thus, the organization changed its name to Side with Love. And while they were making a shift, so too did composer Jason Shelton, who has officially changed the name and lyric of his song, #1014 in our teal hymnal, to Answering the Call of Love. And in changing those lyrics, the song becomes more active, more engaged in the work of the second principle. I think you can see how this begins to work together. I think about the table blessing that calls us to be thankful for the many hands make a meal possible – the farmers who grew it, the workers who picked it and packed it, the truckers who transported it, the grocers and stock boys and cashiers who sold it, the cooks who prepared it, the waiters who served it. Our food comes from all over the country, all over the world. We cannot know for sure where the orange I have in my hands has been, who has handled it. So how can I not want to affirm and promote a world community, when that world community feeds me? And that’s just one example. When we see ourselves as both an individual and part of something bigger, we begin to see others the same way. And that’s not always easy. Sometimes we get too self-focused and see every act, every word, every decision just about ourselves. Or we get too outwardly focused and feel lost and used and burned out. Our transmogrified principles – looking the same on the outside but feeling new and different on the inside – reminds we are both-and. So we can see how many of these might work. But how might we understand some of the more individualistic principles, like encouragement to spiritual growth? That seems awfully individualistic. And on one hand, it is. My spiritual path is not your spiritual path. As we like to say, we need not think alike to love alike. In this room, I suspect we have Jews and Christians and atheists and pagans and who knows what else? But even this principle – a vital one to be sure – both benefits from the going out and the coming in and strengthens both. Once you see it, it can’t be unseen. 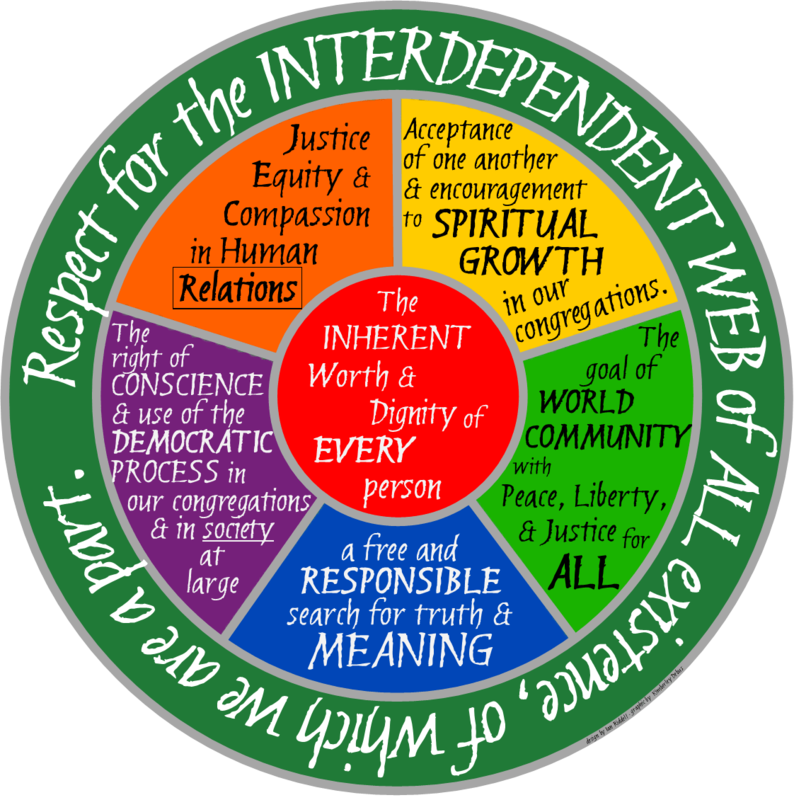 Now we can’t think of the principles without thinking about the wheel and the spokes and the interconnectedness. We have transformed our way of thinking about it… we’ve transmogrified our principles, our ethics, and our faith. And maybe that’s the real message – not that we become something new overnight, but that we – and our world – and how we act in it – is deeply and inexorably interconnected, interdependent. And that’s not just about how we act outside these walls but how we act inside them too – how we are with each other. Some of us can be too inwardly focused, or outwardly focused, and we forget the gifts of both receiving and giving love, compassion, energy, encouragement. There’s a lovely Buddhist meditation that bring this home; and you may be surprised that it was set to music by the guy who started this all off, Ian Riddell. Excellent, Kimberley. Thank you for sharing!